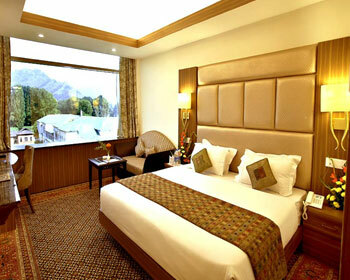 Hotel Grand Mumtaz is a very well known and respected hotel in Srinagar. 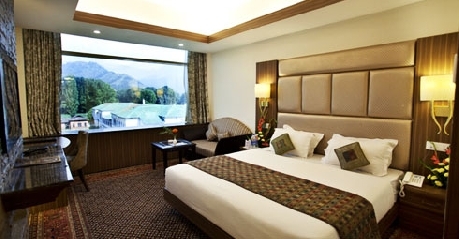 The property is a five star offering of Grand Mumtaz hospitality group and offers lavish and comfortable accommodation options to guests visiting Srinagar. 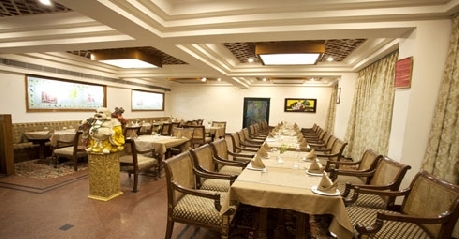 The Grand Mumtaz Hotel is located in Golf Course are on Maulana Azad road; therefore is well connected to major commercial and tourist centers of the city. 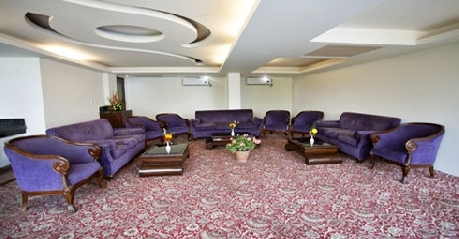 Grand Mumtaz hotel is a gem in hospitality sector of Kashmir and offers royal luxury and premium comfort to visitors. 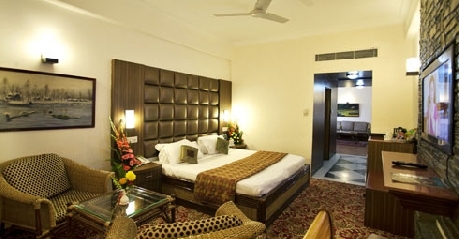 On accommodation front, Hotel Grand Mumtaz offers 80 well furnished and lavish rooms or suites that are tailored to meet all needs and requirements of patrons. The Rooms are classified into three categories of Super Deluxe Rooms, Executive Suites and Presidential Suite, to cater to different requirements of diverse clientele of the hotel. All the rooms sport contemporary décor setup that is fused with local cultural elements to give it a more regal feel and appeal. Moreover, the rooms are also provided with modern facilities and amenities to keep patrons comfortable during their stay here. Apart from accommodation, the Grand Mumtaz Hotel has also developed three mesmerizing culinary delights in the form of Mezbaan Bukhara – the Kashmiri specialty restaurant, Gupshup – the coffee shop and China Garden – the Chinese and Thai diner. 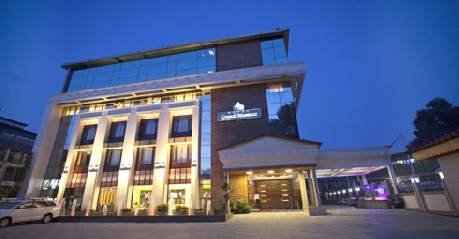 Other facilities offered by Hotel Grand Mumtaz include Milchaar function hall, Chinar conference hall, Mumtaz Craft – the souvenir shop, laundry facility, health club with sauna bath and steam bath facility, swimming pool, open BAR BE QUE service, travel desk, doctor on call facility and many more. Looking for an accommodation option that combines premium comforts and classy décor setup, then you have come to the right place. 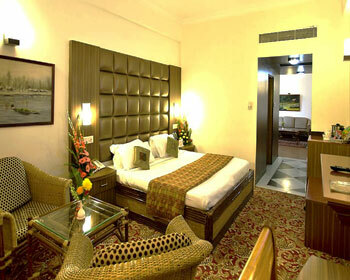 Hotel Grand Mumtaz offers Super Deluxe Rooms that provide just that and much more than that. 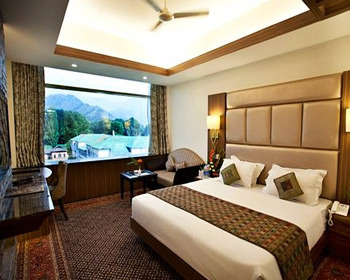 The Super Deluxe Rooms are aimed at solo travelers and couples traveling to Srinagar and need comfortable set up for their vacation stay needs. The Rooms have contemporary décor setup that is fused with traditional architectural style of local region to give the rooms very regal ambience. The delightful interiors of the Super Deluxe Rooms can also be attributed to premium furnishing and perfect and finish that makes them look and feel great. As far as amenities are concerned, the Super Deluxe Rooms are equipped with all necessary modern facilities to keep guests comfortable. 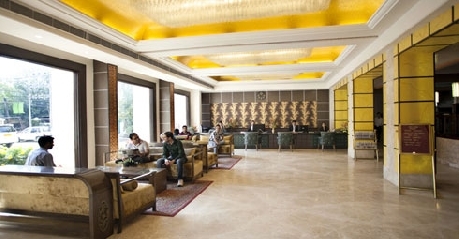 The notable among them include central air conditioning and heating facility, mini bar or refrigerator, LCD television set with satellite connectivity and subscription to premium channels, direct dial telephone line, business newspaper, secretariat service, high speed internet access through Wi-Fi, plush bed, seating unit, wardrobe and lavish bathroom with superior toiletries. The simple yet elegant nature of Super Deluxe rooms has won hearts of many local and foreign guests who have stayed at the hotel. If you like to enjoy kingly pleasures and value your indulgences more than anything else, then the Presidential Suites offered at Hotel Grand Mumtaz in Srinagar, will surely impress you. The Suites are designed and aimed at high profile guests and VIP travelers who value their comforts and have distinct taste when it comes to quality accommodation choices. Keeping in mind this, the Presidential Suites are tailored by incorporating everything premium, be it interiors, décor or amenities. The Presidential Suites are designed in collaboration with expert architects in such a way that they not only look good but are also very practical when it comes to stay choices. The Presidential Suites sport contemporary décor and interiors that are fused into traditional cultural architectural style. This is further reflected in the regal charm and cheerful ambience of the Presidential Suite. These Suites are spacious in nature and consist of living room, bedroom, dining setup, seating unit and lavish bathroom with premium fitting and facilities. Other amenities offered as part of Presidential Suite are central air conditioning and heating facility, mini bar or refrigerator, LCD television set with satellite connectivity and subscription to premium channels, direct dial telephone line, business newspaper, secretariat service, high speed internet access through Wi-Fi, plush bed, seating unit, wardrobe and lavish bathroom with superior toiletries. Apart from scenic beauty and enchanting natural scenery; Kashmir is also very popular among tourist for its awesome food. Kashmir being the paradise on earth, the ethnic cuisine of the state is surely a gastronomical paradise for foodies. To present the rich culinary heritage of the state, Hotel Grand Mumtaz has developed an in house restaurant named Mezbaan Bukhara. The restaurant is located on the premises of the hotel itself and serves authentic and genuine Kashmiri food to patrons. The food is prepared as per traditional recipes and cooking techniques and use of rare spices and herbs brings out the unique flavor of the dishes. Patrons will find an array of vegetarian and non-vegetarian items listed on the menu here. Special care is taken by the Mezbaan Bukhara Restaurant management to ensure great quality and scrumptious taste to make food not only good in taste but also in terms of health. Apart from this the restaurant itself has drawn praise from patrons because of its simple yet elegant décor that is in line with Kashmiri culture. The attentive service and warm hospitality of restaurant staff also makes you feel welcome at Mezbaan Bukhara, thereby making dining here a very memorable experience. If you are one of those people who suffer from untimely hunger pangs or have an unmanageable time schedule to keep; then you will appreciate Gupshup – the on site coffee shop at Grand Mumtaz Hotel. As the name suggests, Gupshup is a friendly place to catch with friends and loved ones over your favorite snacks and beverages. The Coffee shop is situated on lobby level of the hotel and serves an assortment of refreshing cold and hot beverages to keep patrons active. The Coffee shop also serves different types of snacks, mini meals and eatables to help patrons stay full and satisfied or just grab a bite on the go. Although small in size, Gupshup has been the official hangout joint for patrons for both personal gossip sessions with friends or formal business meetings with colleagues. The semi-casual setup and décor of Gupshup, coupled with easy to go ambience makes it a hit among youngsters.